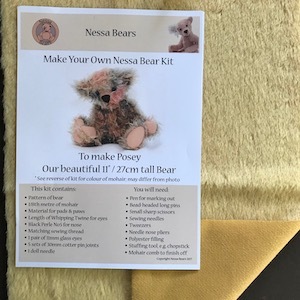 This is a kit to make a gorgeous 27cm 11” Teddy Bear like Nessa Bears Posey30. 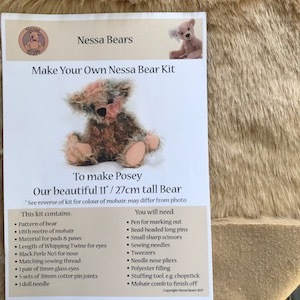 This is a kit to make a gorgeous 27cm 11” Teddy Bear like Nessa Bears Posey and will come to you with the material in a fat 1/8thsize. 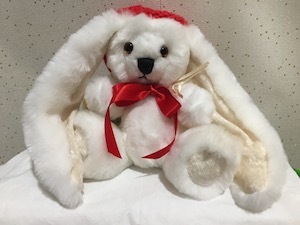 The material is a really soft 15mm teddy bear beige plush fur fabric’ – pattern and colour as shown in the photos here as closely as possible. Other colours and types of material are available in other kits. 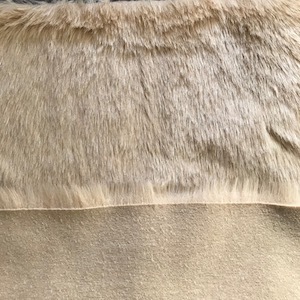 The underside of the fabric is shown in the pictures as this is very similar to how the nose will look once the longer hairs around the nose are plucked or trimmed to about 3-4mm to help give the face shape. 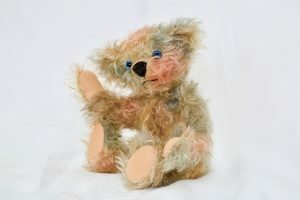 Included are :- a full sized pattern of the bear and detailed instructions for its construction together with contrasting material for the pads and paws, English glass eyes and whipping twine to insert them and to pull up the neck joint of the bear; cotter pin joints, sewing thread and perle cotton for embroidering the nose and a long doll needle to use inserting the eyes and sewing the nose. 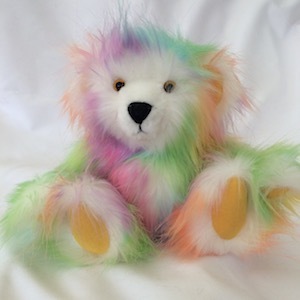 Each bear you create will develop its own little character as you sew and you will see this most clearly when you put the eyes in and sew its nose – the next one you do will probably look totally different, you can give them whatever expression you like. The power of creation of the little bears becomes quite addictive! 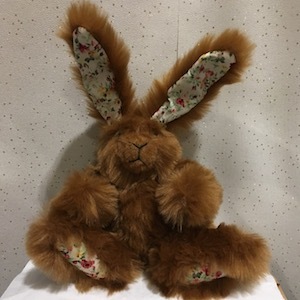 Please send me a photo when you have finished your kit and I will put it into a gallery!